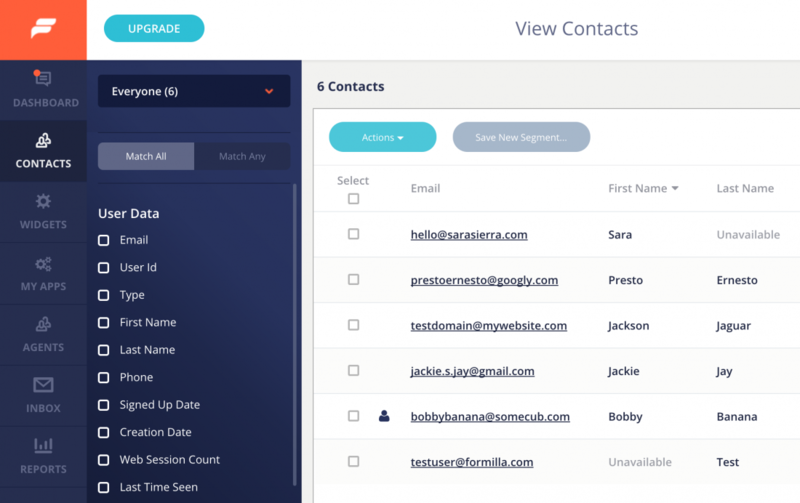 This post outlines the new, and powerful Contacts section of your Formilla account. All your leads are collected and organized using powerful filtering, searching, tagging, and segmentation so you can find what you need really fast. Let’s get right into the details! Any information provided by the website visitor when initiating a chat conversation or submitting an email when you’re unavailable — such as First Name, Last Name, Email, Phone, etc. — will be recorded as a record in the Contacts section of your Formilla account. On the left-hand side of the screen, you can filter contacts quickly based on many different criteria. As you enable and change filter criteria, the contacts will automatically refresh to match your criteria. In this example below, we want to see any contacts from the country Spain which have visited our website at least 3 times or more (frequent visitors). As you can see, we selected to “Match All” the criteria, meaning both a “Web Session Count” greater than 2, and “Country” containing Spain. 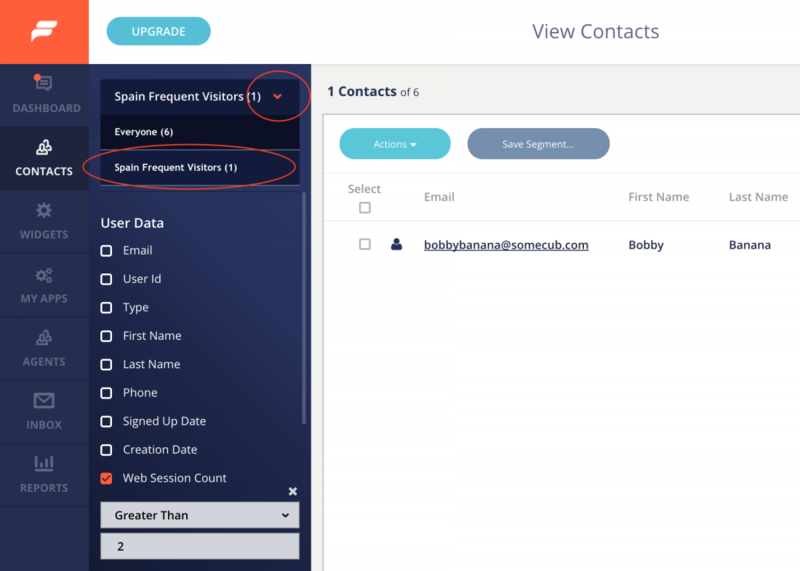 If we had chosen “Match Any”, the contacts displayed would include any visitors with a session count more than 2 and/or their location country being Spain. 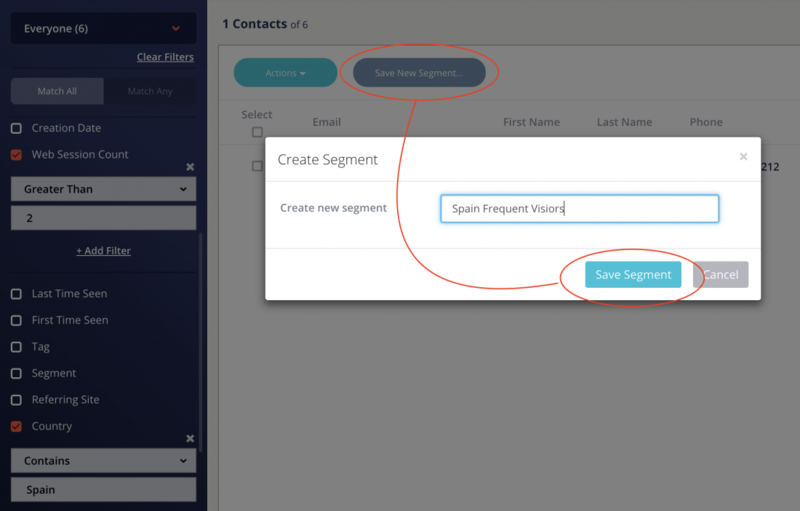 You can create Segments as an easy way to filter for a specific set of contacts that meet certain criteria at a later time. The great thing about Segments is that they automatically update to include your latest contact data. Using the example from above, let’s create a Segment called “Spain Frequent Visitors” by clicking “Save New Segment…” at the top of the page. To access a previously saved Segment, simply click the Segment dropdown from the top-left of the screen and choose the segment. The number of contacts in that Segment is shown in parentheses such as (1). 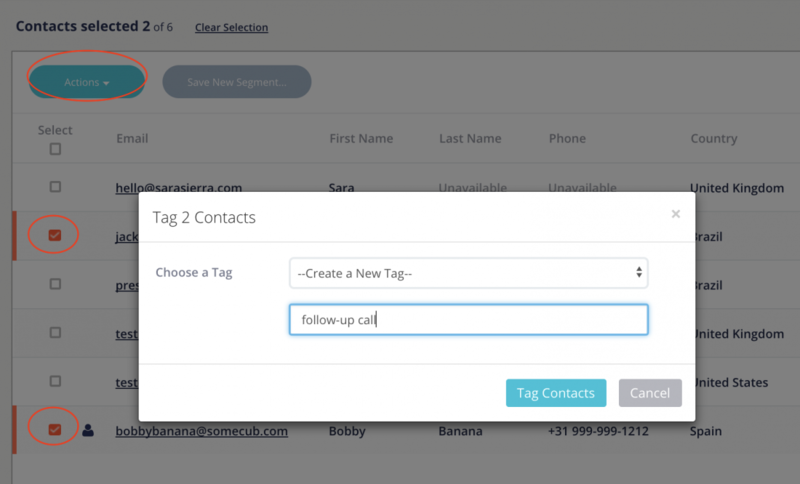 The Actions dropdown allows you to tag, or delete, one or more contacts. Tagging is especially important when you’d like to assign certain characteristics to a given contact record. For example, below we’re tagging these two contacts with “follow-up call” to perhaps close a sales deal, or answer some questions. To tag contacts, check the box next to each one you’d like to tag, then choose “Tag” from the “Actions” dropdown shown at the top of the page to see the popup below. 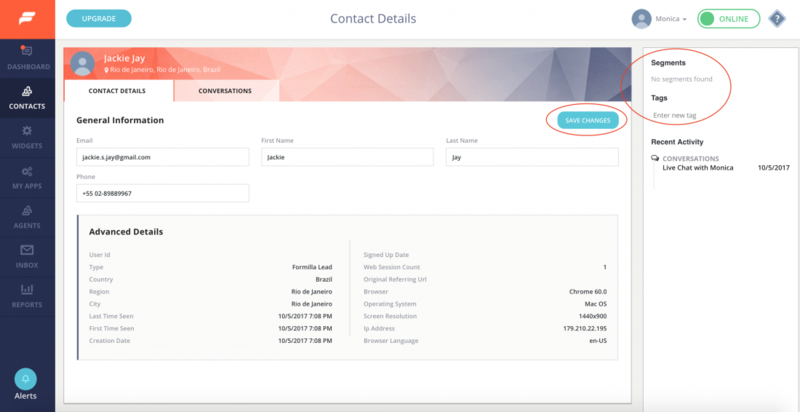 To delete contacts from your Formilla account, just as with Tagging above, you can select multiple contacts by checking the box next to each one, and select “Delete” from the “Actions” dropdown at the top of the Contacts page. 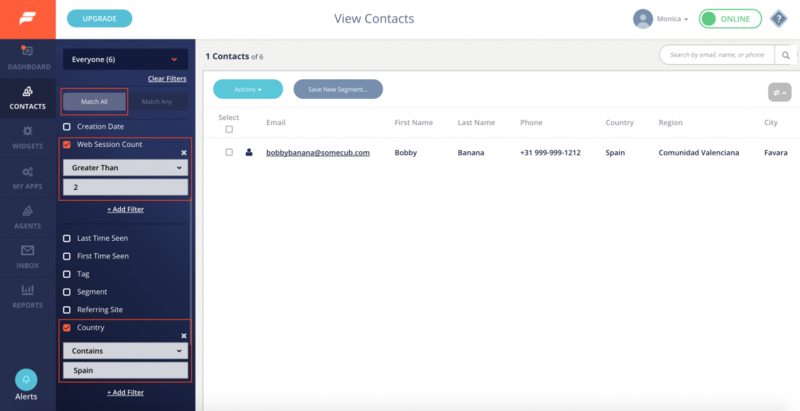 Easily search contacts in your account by name, email, or phone number as well. Below, we typed “Jack” in the search box and the contacts automatically refreshed to narrow the contacts to just 2 results for Jackie and Jackson. To hide or show fields (columns) from the Contacts screen, click the gray icon on the right-hand side of the Contacts screen to see the fly-out menu with all the fields available (see #1 below). You can also change the sort order of your contacts. By default, contacts are displayed by their create date in descending order; the most recent will be shown at the top. You can change the sort order by clicking the column header once to go in descending order, and again to go in reverse, ascending order. As shown in #2 below, the contacts are sorted by First Name in descending order. Clicking on a Contact record will enter the details area where you can add or modify information about this customer. The primary fields at the top include Email, First Name, Last Name, and Phone, followed by a consolidated view of additional information in the Advanced Details at the bottom. If you make any changes to the information here, be sure to click “Save Changes” towards the top-right of the page (circled below). In the right rail we include any Segments this contact is included in, along with any Tags associated to them (also circled below). You can enter tags for this contact record by simply typing where it says “Enter new tag” and hitting Enter on your keyboard. To remove a tag, simply click the ‘x’ on the tag. Note: you do not need to Save Changes when adding or removing tags as your changes are automatically saved. All previous communications with a contact can be viewed from the Conversations tab, circled below. Specifically, any live chat or offline email submission received from this customer is organized beginning with the most recent communication at the top. Simply click the Live Chat or Offline Email link to open a new browser tab directly to the conversation/transcript in the Formilla Inbox. In the event you need to manage your Tags and Segments, you can do so by mousing over “Contacts” and choosing the corresponding link from the sub-menu that appears (shown below). You can view all the Tags and Segments you’ve created (in alphabetical order by name), what date they were created, and by which account user. You can also edit the Tag or Segment name or delete it entirely. 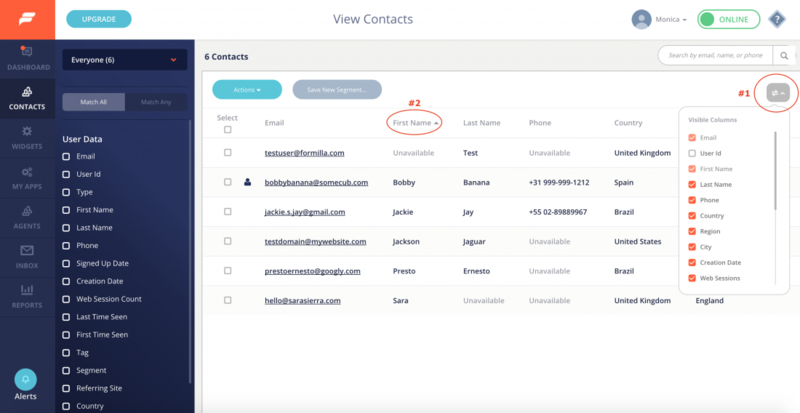 Note: if you delete a Tag or Segment, any contacts associated with it will not be impacted; it will simply not be assigned on the Contact record or displayed in the right-rail of a Contact Detail record.